Adventurous and puzzle solving pirates must escape this VR galleon or be cursed! This spring, VR arcade guests will play virtual reality games as puzzle-solving pirates. Vertigo Arcades of “Arizona Sunshine” fame and INNERSPACE VR are at the helm of “Corsair’s Curse”. Paralleling the nautical theme of “A Fisherman’s Tale”, “Corsair’s Curse” takes players on a course for adventure. The 4D, free-roam, and LB VR experience is played with two to four players. It’s for all ages (13 years+), so both elder pirates and young ones can play too. Vertigo Games told us that the experience supports the HTC Vive (Pro) headsets. Depending on the arcade, the game supports wireless adapters and VR backpacks. They say, “We advise and assist every Arcade on recommended hardware for the best experience.” The studio recommends that arcades use 4.7m x 6.2m of play area for the best gaming experience with “Corsair’s Curse”. Demo It at GDC or Wait Until Spring! Select guests at GDC can jump into the virtual reality game while they’re between demos and meet and greets. GDC is the first North American event they’ll be demoing the new game at. Much like “A Fisherman’s Tale,” “Corsair’s Curse” tinkers with escape room mechanics and player size. Their site says the game lasts for about 30-minutes. Exploring and finding ways to use their unique character and environment is key. Players solve puzzles, find treasure, and escape the bewitched ship. The virtual reality game will be entertaining visitors at VR arcades in open spaces. Vertigo Games and Vertigo Arcades aren’t new to free roam. They did it with the zombie game “Arizona Sunshine”. VR arcades with floor space and the funds have game support for 4D effects. Wind and floors that vibrate are something guests can’t have installed at home. We asked if there’s a Vive tracker to support extra props, and they told us that they are not supported right now. Location-based VR games and experiences like “Corsair’s Curse” is a sign that studios are stepping up their game. They’re unleashing VR’s potential to become multi-sensory attractions. Immersive digital environments and fantasy storytelling skyrocket VR games to a higher caliber. Especially reactive environments that shake and blow gusts of wind and let players walk unattached to wires. We can’t yet install moving floors and can only turn on a fan for special effect at home. Good thing for the return of the arcade and out-of-home attraction! Richard Stitselaar, Managing Director at Vertigo Arcades shares how gaming experiences at VR arcades influence headset purchases. What he describes is a lot like how park attractions based on movies don’t get in the way of movie or DVD sales. They often strengthen franchises. “Arizona Sunshine” has earned its place as a seminal LB VR and in-home game title. 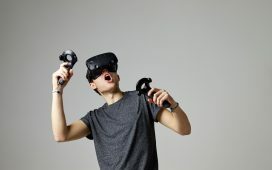 The same effect that VR arcades offer is looking to be true of Vertigo Games and Vertigo Arcades virtual reality games.